Native Instruments are one of the most well-known makers of audio production software, and are responsible for industry-standard synthesiser program Reaktor as well as the definitive stand-alone software DJ package Traktor – and now the rather useful Final Scratch. 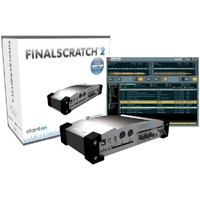 The FS package has two main elements – the Scratchamp and the FS software. The Scratchamp is a small piece of hardware that you connect to both the USB port of your computer and to the phono outputs of your turntables. This serves as an audio interface for the software, and passes the timecode from the FS discs on your turntable into the FS software on your computer. Once you have everything set up correctly, with the Scratchamp linking your turntables to your computer and the FS timecode discs in place on the platters, you can then cue up tracks from your hard drive in the FS software. This allows you to play those tracks on your turntables as if they were actually on the vinyl – you can scratch and mix just as you would in a standard setup. However, as this is also a digital system, it offers a degree of flexibility that could not be achieved with actual vinyl.